One of the best selling Quarter Copper Half Moon Eggbutt Snaffle Bits is offered here at our online horse tack store. The eggbut style keeps the mouthpiece from rotation around the rings. Superior quality Horse Tack products and Quarter Copper Half Moon Eggbutt Snaffle Bits are on sale now. The Eggbutt Snaffle Bit has copper which encourages moistness and fluidity and horse is also likely to not reject the bit while playing with it. 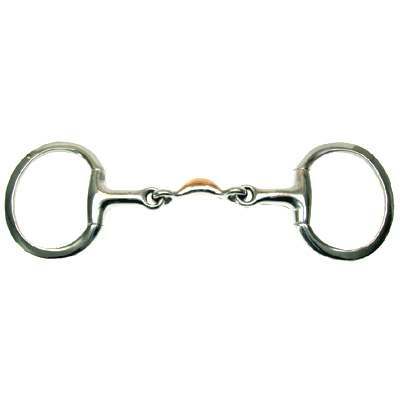 This item is also made of solid stainless steel and measures 2'' in rings and 11mm mouth.This Horse Bit also reduced snapping action between the rings and mouthpiece. This product has been engineered to offer great comfort for your horse while lasting many years.